Your kid's birthday party is the highlight of her year. Whether sending out paper invitations or evites, keep parents in the loop and kids excited to attend by choosing the perfect words for your kid's birthday party invitations. Your child's invitation is the perfect place to highlight the fun of childhood. Look for inspiration in children's songs, rhymes, books, and movies. 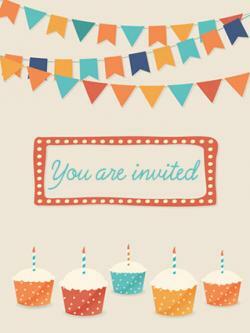 The invitation should not only fit the party theme but also capture the personality of your child. Superhero Theme: It's a Bird, It's a Plane, It's Super Owen! Grab your cape and fly on over to the Secret Headquarters (12 Long Lane) to celebrate Owen's Incredible Feat - Turning 5! Sports Theme: Another one for the record books folks - Jeff just scored his 3rd Birthday! Suit up and join the team, Parents vs. Kids t-ball game starts at 4:00 pm on Friday, June 5th in Jeff's backyard. Beach Theme: Jump in and make a SPLASH, at Jennifer's 6th Birthday Beach Bash! Farm Theme: Old Jill Johnson had a farm, ee-i-ee-i-o, and on her farm she just turned 4, ee-i-ee-i-o! Video game Theme: It's Game Over for 6-year-olds! Gabe just defeated kindergarten, earning his title of 7-year-old! Dr. Seuss Quote: "Today you are you, and that's truer than true. There is no one alive that's youer than you." Winnie the Pooh Quote: "A day spent with you is my favorite day. So, today is my new favorite day." Spa Theme: Get pampered and spoiled at the Smith Salon (123 Addleboro Dr.) this Saturday. Dinosaur Theme: Get your best ROAARRR ready for a dino-mite time at Aiden's 5th birthday! Your presence is present enough! Good wishes make the best gifts! Nora likes to sing, color, and cook. She's lucky to have all the supplies she needs, but will never refuse an exciting new book! Her Majesty asks that parents attend, formal attire is optional. Ladies and gentleman! Boys and girls of all ages! Pet the animals, catch the juggling act, and watch out for those silly clowns! The show starts at 4:00 and ends at 6:00. Food vendors open at 5:00 with cake to follow! Ringmaster Jonah loves Ninjago, Pokemon, and baseball. Providing as much information as possible on the actual invitation will alleviate stress on you by lessening the number of calls with questions from other parents, helping you feel prepared for the event, and ensuring that no one is left out or misses important details. Experts at Parents.com suggest sending out invitations at least two weeks before the party, but no more than four weeks ahead of time. This will give guests adequate time to prepare without forgetting about it entirely. Whether the wording for your child's birthday invitations covers only the basics or includes poems or quotes, keep sight of the fact that you want your guests to feel welcome. Keep the focus on fun and you are sure to find the right words to get guests excited.